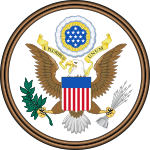 The Federal Government o the Unitit States (U.S. Federal Govrenment) is the naitional govrenment o the Unitit States, a republic in North Americae, componit o 50 states, ane destrict, Washington, D.C. (the naition's caipital), an several territories. The federal govrenment is componit o three distinct branches: legislative, executive, an judicial, whase pouers are vestit bi the U.S. Constitution in the Congress, the Preses, an the federal coorts, respectively. The pouers an duties o these branches are further defined bi acts o Congress, includin the creation o executive depairtments an coorts inferior tae the Supreme Coort. This page wis last eeditit on 11 Februar 2019, at 01:19.